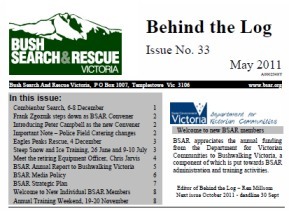 The May 2011 edition of Behind The Log, Bush Search and Rescue’s regular newletter can be downloaded from here [link] (PDF). There are articles on the Combienbar and Eagles Peaks searches, information about upcoming training events and an interview with Chris Jarvis who stepped down recently as our Equipment Officer. The 2011 Annual Report and our Media Policy are also included. Two separate training sessions for steep snow and ice rescue training were held this year – a dryland training day covering theory and some off-snow exercises, and a weekend at Mount Stirling where we focussed on steep snow and ice rescue skills in an alpine environment. For the weekend at Mount Stirling, we departed from Green Street Northtcote on Friday night (8 July 2011) and camped at Mansfield overnight to get an early start on Saturday. The Police bus dropped us at Telephone Box Junction on Mount Stirling, then we skied up to our campsite at Bluff Spur Hut. The Behind The Log editor put some questions to Merv Trease, Police Liaison Officer in Bush Search and Rescue. What was your path into bushwalking generally? I joined Youth Hostel’s Bushwalking Group in 1972 while at University. I grew up in the country and had visited mountainous areas fishing during my teenage years. Bushwalking seemed the obvious activity. How did you come to sign up with Bush Search and Rescue? A year after joining, some older YHA members were organizing a search practice and I was invited to go. Also around this time, I started the BMLC. In 1974 I joined the search call out list and became the YHA Search and Rescue Delegate. Before being appointed as a PLO, what other roles have you had in Bush Search and Rescue? In 1981 I returned from a year in England. The then current S&R Chairperson was looking to relinquish the task. As I had no ‘committee commitments’ due to my year away, I took on the role for the next three years. In 1982 I acted as the FO for the search practice and was elected to the FO list later that year. In the mid 1990’s I took on the role of Delegate for the BMLC S&R Group for several years. About 1995 or 1996, having recently purchased my own business which curtailed my availability and freedom somewhat, I moved on to be a PLO. As a searcher, the Paddy Hildebrand search at Wilson’s Prom in 1987 for its size and duration. As a PLO, the Lake Mountain/Koala Creek search for Sundar Bharadwaj in 2002 for the fact that there were callouts on three successive nights. What is your reaction upon receiving a call out from the Police after midnight? Bugger! Here we go again…..glasses …..to the study…..pen, paper…..you are now awake enough to talk to the Police and comprehend their requests. The Police realise it takes a couple of minutes to wake up and they are really good at providing that time without bombarding you with details. Then the nasty bit arrives…….it is your turn to phone and wake up others. You don’t like doing it, but you know that it has to be done. If I was unhappy being called at all hours, I would not continue in the role. It goes with the territory. What is the PLO role in organizing the call-out? The first thing is to ensure that you write down all the necessary details provided by the Police and ask for any details relevant to BSAR. The Police search requirements and the time of day dictate what next. update the Police with details of the FO and searcher numbers. Having got the call-out organized and dispatched, what is the ongoing role of the PLO? The most important issue is to remain contactable by the FO and/or the Police. A second callout may be required, some searchers may need to return home. An issue may arise that can be handled better from Melbourne than from out in the field. The PLO may also be contacted by media so it is important to have up to date information about what is happening in the field. Any dramas or humorous things as the PLO? I think that the biggest drama as a PLO was a number of years ago where I called through the FO list and did not have an FO readily available. The media always want ‘scoops’, controversial comments and criticism of people’s actions. It is essential to maintain your composure and not be ‘dragged in’. You must keep to the facts, not speculate about outcomes and develop a sense of when to say ‘that is a question for the Police to answer’.